Hillary Clinton hit the campaign trail last weekend with a long-time adviser who allegedly helped steer funding to an illegal pro-Clinton "shadow campaign" in 2008. Minyon Moore, a political consultant who led Clinton’s black outreach efforts in 2008, joined Clinton in Nevada on Saturday where the candidate met with African American business owners. 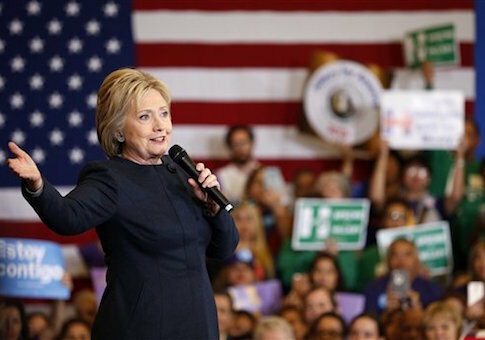 The Clinton campaign has been vigorously reaching out to black voters ahead of Super Tuesday. Moore has been a key adviser to Clinton throughout the 2016 primary race and a member of her National Finance Committee, but has largely avoided the spotlight. A Clinton spokesperson declined to comment on whether she is currently being paid by the campaign. Dewey Square Group, a consulting firm where Moore serves as a senior consultant, is on the payroll of pro-Clinton super PACs Correct the Record and Priorities USA, according to records. A Dewey Square Group spokesperson told the Washington Free Beacon that "Moore is not being paid directly or by Dewey Square Group to work on the campaign." "There is nothing to say about the allegations raised by the media other than they proved not to be accurate and as stated at the time, Ms. Moore conducted herself, as she always has, not only in full compliance with the law but in accordance with the highest ethical and professional standards," said spokesperson Ginny Terzano. Moore is mentioned, although not by name, in the federal criminal cases against D.C. businessman Jeffrey Thompson and political organizer Troy White. Thompson pleaded guilty in 2014 to conspiracy to violate federal campaign finance laws, and White pleaded guilty to failure to file corporate tax returns. Thompson told the court that in 2008 that he personally financed an off-the-books $600,000 shadow operation for the Clinton campaign—which is also not identified by name in the court documents—in the Texas, Pennsylvania, North Carolina, Indiana, and Puerto Rico Democratic primary races. White said he used Thompson’s money to organize and pay "street teams," to hand out Clinton campaign materials and try to drum up enthusiasm for her candidacy against Barack Obama. Moore was not charged in the scheme, but court documents indicate that she helped find funding for the shadow campaign and provided organizers with internal information and official materials. Dewey Square Group told the Washington Post in 2013 that Moore "was entirely unaware of any inappropriate activities." Moore, who is identified as "Individual A" in the court documents, introduced White to Thompson after the Clinton campaign declined to pay for the street teams itself, according to prosecutors. "I am piping up saying we need your services," Moore told White in a Jan. 31, 2008, email, after another Clinton campaign aide said the campaign could not fund the operation. "Let’s [find] some money. I will fight for it." Moore introduced White to Thompson, a wealthy executive who had steered illegal donations to campaigns in the past. She described Thompson as a "business owner in the District of Columbia who wanted to organize an effort to support [the Clinton campaign]." Moore also introduced White to a Clinton supporter in Texas who would help organize the street teams in the state, according to court documents. She also allegedly arranged for the Clinton campaign to provide the canvassers with officially prepared materials to distribute and with "confidential internal information" for scheduling purposes. Thompson poured hundreds of thousands of dollars into the effort, disguising the in-kind political contributions as business expenses. The businessman pleaded guilty to conspiracy charges on Mar. 10, 2014. He is still awaiting sentencing. White pleaded guilty in September 2013 and was sentenced to one year of supervised probation, which he requested to be carried out in Nairobi, Kenya. Clinton was not the only politician whom Thompson allegedly tried to help through shadow campaigns and straw donor efforts. He said he also funded a shadow operation for Washington, D.C. Mayor Vincent Gray in 2010, in exchange for promises from Gray aides that the mayor would help Thompson’s business. Federal authorities attempted to build a case against Gray, but the investigation was dropped without charges late last year. Several of his aides pleaded guilty in connection with the shadow campaign. Update 11:25 a.m.: This post has been updated to reflect comment from Dewey Square Group.